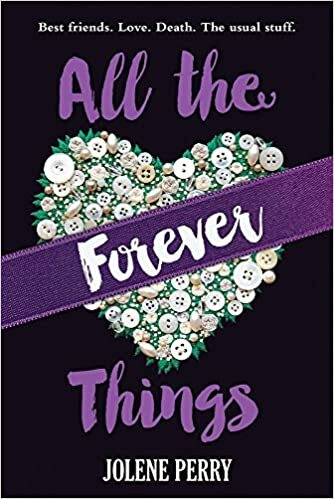 This week brings All The Forever Things by Jolene Perry. A great YA book about a girl that lives in a funeral home. I loved almost everything about this book, the setting was great, and I loved the impact living in a home had on the main character. I’ve never read a book set in a funeral home, so this was a new one for me. It’s one of many books I’ve read recently that are YA but not YA fantasy, and I think this one stood out. From growing up in the funeral home her family runs, Gabriella knows that death is a part of life and nothing is forever. Yet Bree, her best friend, has been a constant; it’s always been the two of them together against the world. But when Bree starts dating a guy―the worst guy― from that ultra-popular world, suddenly she doesn’t have time for Gabe anymore. Now the only one at school who wants to spend time with “Graveyard Gabe” is Hartman, the new guy, but Gabe, not wanting to lose her mind over a boyfriend the way Bree has, holds back. It takes a very strange prom night (with the family hearse instead of a limo) for Gabe to truly fall for Hartman. But when she leaves the after-prom party with him, she’s not there for Bree―or for the deadly accident that happens that night. Bree survives, but will she and Gabe ever be able to rebuild their friendship? I liked all the forever things, I was left with a warm and fuzzy feeling in my tummy. I connected with the main character, although I do think the author got a little confused between what she thought she was in her mind and how she was being represented on the page. Perry made out like Gabe was selfish and that she was in the wrong for what happened to her and Bree’s relationship. But I’m not sure I got that. I think she was just a young girl, desperate to keep her friend. She didn’t come across selfish to me and in some respects, the fact Gabe backed down, and apologised was a bit disappointing. I loved the concept of this story and the fact Gabe had become numb to emotion because she was constantly surrounded by death. I would have liked to have seen the change and growth of feeling start earlier on rather than all at the end. But despite that, the growth that was there at the end was really good. I loved the flip from things are temporary to things are forever, and some of the philosophical moments attached to that really touched me. I really enjoyed the relationship between Gabe and Hartman, I smiled and laughed so many times during their moments together in this story. I wasn’t so keen on the relationship between Gabe and Bree, it felt controlling and possessive and it didn’t really ever change from that. I’d have liked to of seen some growth there too or some kind of character arc. I didn’t like the fact that Gabe never stood up for herself. It felt like things happened to the character rather than her curate them. Perhaps that was how the story was written. But my personal preference is for the character to be more active. That being said, I would definitely read another book by this author. My thanks to NetGalley and Albert Whitman and Co for an advanced copy. If you’re interested in following my book publishing progress, you can sign up here. A very good review of this book, Sacha. Thanks so much Robbie – sorry it’s taken a month to reply – this website has gone a bit dormant while I finish up a manuscript. I added this book to my list on Amazon, and I checked, this author has written more books. I always enjoy discovering another author I like and that they have more books out.